Dr Roberta Mazzieri obtained her PhD in Genetic Science from the University of Pavia (Italy) and subsequently undertook one post-doctoral position at the New York University (USA) and two at the San Raffaele Scientific Institute in Milan (Italy). Since her PhD studies, she focused on understanding the tumor microenvironment by examining a number of related molecular pathways including the uPA/uPAR system and TGFß1 activation. During her last postdoc with Prof. Naldini, she made her most significant and clinically-applicable contribution to cancer research by exploiting advanced gene transfer technologies to study the interplay between tumour associated macrophages and tumor angiogenesis. She demonstrated that targeting the ANG2/TIE2 pathway inhibits tumor angiogenesis, growth, and metastasis by disabling the pro-angiogenic activity of tumour associated Tie2-expressing macrophages (TEMs), thus impeding the emergence of evasive resistance to anti-angiogenic therapy. In 2011 this work was featured as cover article in Cancer Cell. Moreover, by turning TEMs into efficient delivery vehicles, she worked to target a key immune modulatory protein, IFN-alpha, to tumors and achieved substantial antitumor activity in several tumor models including a human model of breast cancer. This work was published as cover article in Science Translational Medicine. In 2012 she was nominated by the Young Ambassadors from the Metastasis Research Society (MRS) to speak at MRS meeting in recognition of her potential to launch independent research and contribute to high-quality publications. The same year she was recruited by the University of Queensland (Brisbane, Australia) to establish her own research group. At the UQ-Diamantina Institute she is now continuing her work on targeting pro-tumoural macrophages to inhibit tumour progression with a specific focus on breast cancer metastasis. She is also continuing her work on demonstrating the therapeutic potential of turning tumour infiltrating macrophages into efficient delivery vehicles of anti-tumoural biomolecules. In particular, she is now exploring the potential of this strategy to improve the outcome of emerging immunotherapies in breast cancer and Glioblastoma. She is also collaborating in further understanding the role of myeloid cells in tumor progression. While advances in treatment and screening have greatly improved outcomes for most breast cancer patients, major unmet needs remain for treatment of patients with metastatic disease. Breast cancer has not benefitted to the same extent as other cancers from the recent introduction of immunotherapies due to poor inherent immunogenicity of breast tumours associated with a highly immunosuppressive microenvironment. New strategies are needed to overcome these limitations. We identified and characterized a subpopulation of pro-tumoural macrophages: the Tie2-expressing monocytes/macrophages (TEMs) endowed with pro-angiogenic and immunosuppressive activities, both involving signalling through the ANG2/TIE2 pathway. Indeed we demonstrated that blocking the ANG2/TIE2 pathway disables the pro-angiogenic activity of TEMs resulting in inhibition of tumour angiogenesis, growth, and metastasis in mouse models of breast carcinogenesis. We are now investigating whether the in vivo blockade of ANG2 is not only inhibiting the pro-angiogenic activity of TEMs, but also reverting their immunosuppressive activity, thus providing a strong rational for the development and testing of new combination therapies. Moreover, by exploiting the tumor homing ability of TEMs we turned them into an efficient vehicle for the tumor-targeted delivery of a potent immune-stimulatory molecule: interferon-alpha(IFNα) We think that the multiple activities of type I IFNs in the complex network of cell interactions that lead to activation and deployment of immune responses may represent a valid strategy to promote and improve the outcome of cancer immunotherapy for the treatment of advanced breast cancer including lung and bone metastasis. With the final goal of developing more effective anti-tumour therapies, we propose to investigate whether inhibition of the pro-tumoural activity of macrophages results in a less immunosuppressive microenvironment able to enhance the efficacy of promising cancer immunotherapies. The results of the proposed studies may impact on the future course of cancer therapy by providing proof-of-feasibility of new combination therapies. More recently we also started exploring the efficacy and feasibility of combining TEM-mediated delivery of IFNα with immunogenic chemotherapy or nanoparticles mediated vaccination. The most prevalent brain tumour, Glioblastoma multiforme (GBM) is associated with a dismal median overall survival of 1–2 years and a 5-year survival rate of <10 %. Temozolomide, surgical resection and radiation comprise the current standard of care for GBM, but even standard therapy has only modestly improved overall survival. New strategies are therefore highly needed. We previously demonstrated the anti-tumour efficacy of our TEM-mediated delivery of IFNα in a xenografted model of human GBM, and proved the ability of our genetically engineered monocytes to deliver IFNα to brain tumours. As a proof of concept, we are now testing this strategy in immunocompetent mouse models of GBM to demonstrate reversion of the immunosuppressive microenvironment in this type of tumour, thus providing a strong rationale for the design of new combination treatments with emerging immunotherapies, immunogenic chemotherapy and vaccination. Cell migration and invasion. During her PhD in Prof Mignatti’s lab, she described the requirement for cell-surface localization of proteolytic activity as an important regulatory mechanism controlling the extracellular matrix degradation and therefore the invasive potential of both vascular endothelial and tumour cells. Understanding the main players, and most importantly, in which compartment extracellular proteolysis is taking place1 is determinant in designing and developing efficient tools to control cell migration and therefore tumour invasion and metastasis. Growth factor bioavailability. During her first postdoctoral experience at the New York University with Prof Rifkin, she was able to show in vivo that TGFß incorporation into the extracellular matrix controls its bioavailability and is required for proper latent TGFß activation. Understanding how the dynamic remodeling of the extracellular matrix modulate TGFß activation can help understand the role played by TGFß in tumour initiation versus tumour progression. The results were important not only in the contest of tumour progression, but also in explaining a connective-tissue disease known as the Marfan Sindrome. Cell migration, proliferation and transformation. Upon her return to Italy, at the San Raffaele Research Institute (Milan) she worked in the laboratory of Prof Blasi where she contributed to dissecting the molecular mechanisms modulated by an important cell surface receptor (uPAR) highly expressed during tissue reorganization, inflammation, and tumour progression. Understanding how uPAR is controlling several processes involved in different steps of metastasis formation including cell invasion, cell proliferation and cell transformation is of essential importance in the identification and development of new anti-tumour and anti-metastasis therapeutic targets. Pharmacological Targeting of the tumour-host interaction. Dr Mazzieri obtained her most significant and clinically-applicable contribution to cancer research by working in the laboratory of Prof. Naldini at the San Raffaele Telethon Institute for Gene Therapy (Milan, Italy). She contributed to identifying a human subpopulation of monocytes (the Tie2-expressing monocytes, TEMs) specifically recruited to tumours and endowed with pro-angiogenic activity. In collaboration with the pharmacological company AstraZeneca, she demonstrated that targeting the ANG2/TIE2 pathway inhibits tumour angiogenesis, growth, and metastasis by disabling the pro-angiogenic activity of tumour associated TEMs. Delivering bio-therapeutics specifically to tumours. 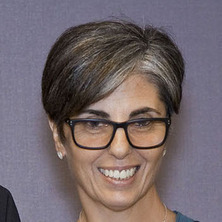 As a project leader in the laboratory of Prof Naldini, by applying the most advanced gene transfer technologies, she exploited TEMs as gene delivery vehicles for targeted delivery of IFNa to tumours and achieved substantial anti-tumour activity in several tumour models in the absence of systemic toxicity. These encouraging results prompted she to Moving towards clinical translation, she also generated the human lentiviral platform for the delivery of human IFNa and tested it for safety and anti-tumour efficacy in a new human hematochimeric model of breast cancer. Moi, D., Wilson, E., Weinert, D., Chiaretti, S. and Mazzieri, R. (2018). ADOPTIVE TRANSFER OF GENETICALLY ENGINEERED MONOCYTES FOR THE TUMOUR TARGETED DELIVERY OF IFN-ALPHA. In: , , (S18-S19). .
Genetic engineering of tumour-infiltrating monocytes to inhibit metastatic breast cancer. The tumour microenvironment plays an important role in modulating tumour progression and tumour response to therapies by fostering tumour growth, and importantly, by counteracting host immunity. Indeed, the establishment of an immunosuppressive tumour microenvironment is one of the hallmarks of cancer and one of the major impediments to the successful application of cancer immunotherapy. Equally important for the establishment of efficient anti-tumour immunosurveillance, is the level of tumour cell immunogenicity. Several projects are available in which the students will investigate whether the ability of locally delivered IFNα to reverse the immunosuppressive tumour microenvironment will complement and synergize with established and new immunotherpies, including a new vaccination platforme, and induce therapeutically relevant effects in suitable models of immunogenic and poorly immunogenic breast cancer and glioblastoma. A role for miR-155 in enabling tumor-infiltrating innate immune cells to mount effective antitumor responses in mice. Rifkin, DB, Mazzieri, R, Munger, JS, Noguera, I and Sung, J (1999) Proteolytic control of growth factor availability. Apmis, 107 1: 80-85. Rifkin, DB, Gleizes, PE, Harpel, J, Nunes, I, Munger, J, Mazzieri, R and Noguera, I (1997) Plasminogen/plasminogen activator and growth factor activation. Plasminogen-Related Growth Factors, 212 105-115. Gleizes, PE, Munger, JS, Nunes, I, Harpel, JG, Mazzieri, R, Noguera, I and Rifkin, DB (1997) TGF-beta latency: Biological significance and mechanisms of activation. Stem Cells, 15 3: 190-197. Ferrari, Giulio, Giacomini, Chiara, Bignami, Fabio, Moi, Davide, Ranghetti, Anna, Doglioni, Claudio, Naldini, Luigi, Rama, Paolo and Mazzieri, Roberta (2016). Macrophages, angiopoietin 2, and corneal neovascularization: translational implications. In: Investigative Ophthalmology & Visual Science. Annual Meeting of the Association-for-Research-in-Vision-and-Ophthalmology (ARVO), Seattle Wa, (). May 01-05, 2016.